Professor David Vann of Warwick's English and Comparative Studies has won the $50,000 St. Francis College Literary Prize for His Novel, Dirt. David Vann’s novel, Dirt, beat more than 170 other books to capture the prize, one of the richest prizes in the United States. 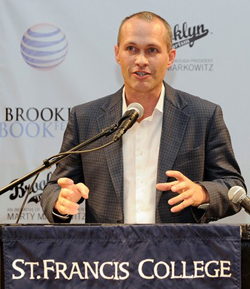 Vann’s selection was announced on 21 September 2013, at the opening night gala for the Brooklyn Book Festival which was held at St. Francis College. Published in 18 languages, David Vann’s internationally-bestselling books have won 14 prizes, including best foreign novel in France and Spain, and appeared on 65 Best Books of the Year lists in a dozen countries.